When you grow up in Houston, with lots of family in Austin, road trips are just a normal part of life. And then add to that the fact that your parents buy a lake house in Austin while you're in college in Waco, and the 2-3 hour drive just becomes a regular routine. Being the most ridiculously large but spectacularly clean gas stations EVER... including their restrooms. Their employees are insanely friendly and kind, which is a huge plus when you've been dealing with two whiny toddlers in a very confined space for the last 2 hours. The world's best tasting BEEF JERKY. The roast I purchased was around $12 for 2lbs. and made what would have cost around $40 of beef jerky at Bucee's! The dehydrator could not have been easier to use. This particular model is set up so you don't have to rotate the trays. Just turn it on and go! Now, what other flavors do you want to see? Let me know in the comments! *Learn how to make medjool date paste here. Wrap your roast in saran wrap and place in the freezer for 2 hours. Next, combine all remaining ingredients in a large gallon ziploc. Seal the bag and shake until well combined. Add all of your meat strips and shake to combine. Allow the meat to marinate for 12-24 hours in the refrigerator. 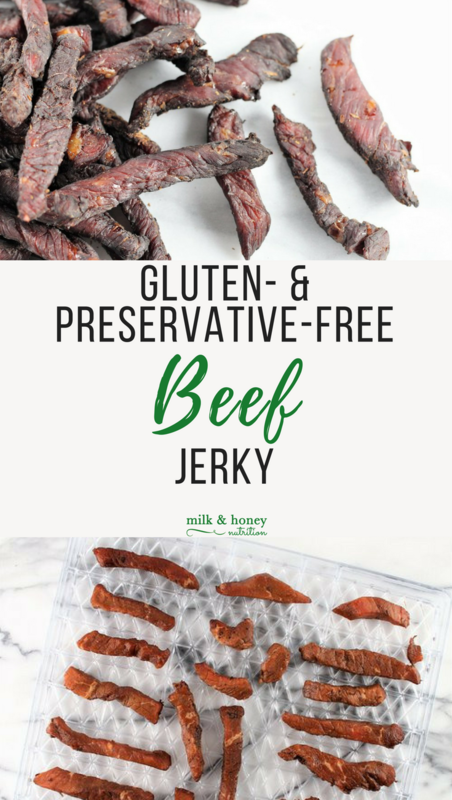 Store beef jerky in a sealed container or bag in the refrigerator for up to 2-3 weeks. Enjoy! Have you checked out the Milk & Honey Nutrition Journal yet?